Fresh peaches are great for skin because they are packed with antioxidants. Apart from eating this delicious fruit, you can apply it on your skin to derive its skin benefits as it boosts collagen production and improves the elasticity of your skin. Plus, it protects the skin from harmful ultraviolet rays and fights free radical damage as it is loaded with vitamin A, vitamin C, vitamin K, B vitamins, beta carotene, potassium, phosphorus, magnesium, zinc, and selenium. 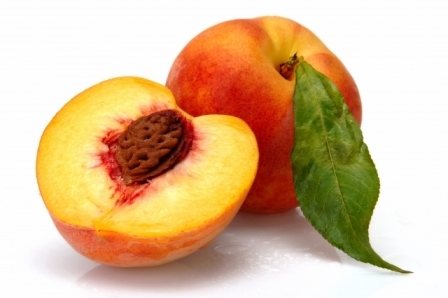 The best way to use peach in a homemade skin-care recipe is to boil the fruit in a pan of water until it becomes soft and then mash it with a fork. However, if the fruit is soft and overly ripe, you may simply remove the pit and mash it directly. • Place half a cup each of chopped peach and papaya in a blender or food processor and puree the fruits along with a cup of plain yogurt and two tablespoons of organic honey. Leave this nourishing and moisturizing face mask on your skin for 15 minutes before rinsing it off. Preferably, apply this recipe during summers after refrigerating it for a while. • Blend a ripe peach fruit in a blender or food processor along with one tablespoon of sour cream. Apply the recipe on your skin and wash it off after 20-30 minutes to tighten the skin, cure age spots, and protect the skin from sun damage. • Simply applying a combination of a mashed overly ripe peach and a quarter cup of heavy cream is good for maintaining beautiful, soft skin. • Prepare a homemade exfoliating recipe by crushing soft peach pulp with the help of a fork and adding one tablespoon of organic honey and a tablespoon of ground oatmeal in it. Scrub it on your skin and then wash it off after 10-15 minutes. Watch the following video showing how to make a peach, honey, and oatmeal facial mask. • Boil one medium-sized peach in water to make it soft. Mash the peeled and pitted fruit and mix one tablespoon of organic honey and full-fat yogurt in it. Spread this mask on your face and neck. Finally, rinse it off after 15 minutes with warm water to rejuvenate dull, sagging skin. • Take about five to eight cherries and a medium-sized peach. Deseed the peach and place it in a blender along with the cherries. After pureeing both the fruits together, apply the resultant paste on your face and neck to maintain younger-looking skin. You can also add some heavy cream in this recipe to make it more nourishing. Similarly, peach can be combined with pineapple and honey to tighten the skin. • Blend one ripe peach, one teaspoon of plain yogurt, and beaten egg white in a blender and apply the resultant paste on your skin. After 15 minutes, wash it off with lukewarm water to get youthful and radiant skin. • Remove wrinkles, dark spots, and dark circles by applying a smooth mixture of mashed peach fruit and one tablespoon each of extra-virgin olive oil, and sweet almond oil. Leave this mask on your skin for about 15 minutes. Besides, regular consumption of this fruit improves digestion, boosts immunity, regulates kidney function, and promotes heart health. In addition, it helps eliminate intestinal worms and is considered beneficial for people suffering from anemia, gastritis, constipation, gout, rheumatism, and high blood pressure.